Here is a short Windows 8 tutorial on how to turn live tiles OFF and ON in Windows 8. The Windows 8 apps have been delivered in a tiles-based interface and some of the apps such as Email, Weather, Calendar, Contacts, etc. display all the updated information. Live tiles, sometimes, make screen very messed-up and crowded. Moreover, you would definitely not like to let other person view your personal mails, hence I have a solution for this. You can easily turn lives tile OFF. Below given is the step-by-step tutorial on how to turn live tile off. Also, check out our post on how to open Chrome settings in Windows 8 style. Go onto the Start Screen of Windows 8. Right-click on that tile you want to turn the live tile OFF. A horizontal bar will open at the bottom of the screen including options such as ‘Unpin from start’, ‘Smaller’, ‘Turn Live Tile OFF’, and All Apps. Click on ‘Turn Live Tile Off’ to enable the action. 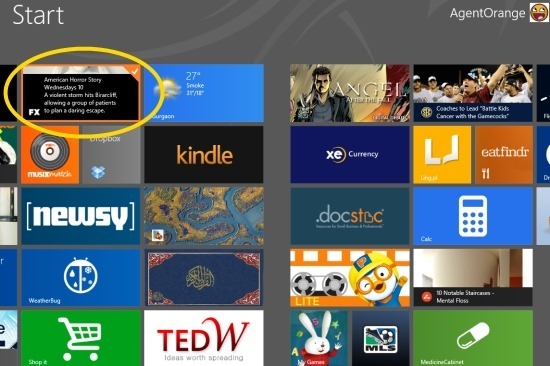 Yes, it’s so very simple in case you do not want any latest info from a particular Windows 8, just turn off live tiles.